GCA Altium has advised fintech company Loanboox, the leading Swiss money and capital markets platform, on raising CHF 22 million in a Series B financing round. Investors include Deutsche Kreditbank AG, LGT Group and other well-known investors from Europe and overseas. As a result, the company's valuation has risen to CHF 122 million. Loanboox, the winner of last year's Swiss Fintech Awards, was launched in Switzerland at the end of 2016 and now employs 40 people in Switzerland, Germany, France and Austria. The business is based on the simple, transparent, secure and inexpensive procurement of financing and investments via a digital platform. Loanboox's clients are public corporations, banks, large corporations and institutional investors. In Switzerland, securitised and exchange-traded securities such as bonds can also be subscribed to via Loanboox. Since Go-Live at the end of 2016, a financing volume of over CHF 20 bn has been requested via Loanboox, and over 1000 customers are active on the platform. 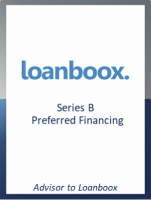 In order to secure further growth, Loanboox carried out a Series B financing round. Founder and CEO Stefan Muehlemann on the strong response from international investors: "We had the opportunity to select the investors who could offer the most added value to Loanboox in terms of content, as we were significantly oversubscribed. In addition, all previous shareholders have again invested. We take this as a great compliment, a sign of confidence and also as an incentive for further expansion both in Europe and of our product range." Even after Series B, the majority of the shares will remain in the hands of the founders and employees. The current valuation of CHF 122 million is a very impressive illustration of Loanboox's success to date, but also of its enormous potential. The aim is to achieve profitability by the end of 2021. With Deutsche Kreditbank and LGT Group Loanboox has gained two renowned investors who, like the other investors, will also contribute their expertise. Muehlemann added: "This is a clear sign of our openness towards traditional market participants. We are proud to have gained DKB, a digital pioneer in the banking environment, and LGT Group, a globally active financial group, as investors." In addition to these two firms, numerous well-known family offices and business angels have also invested.